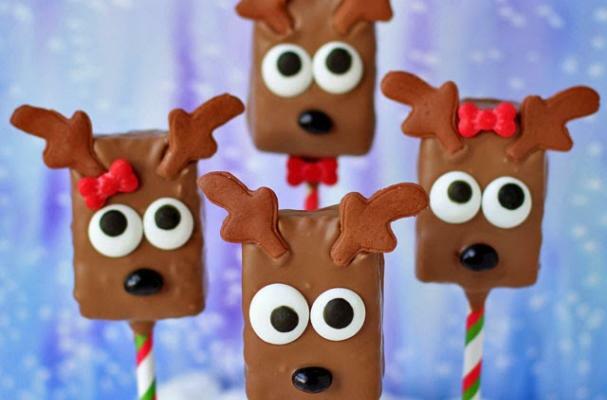 Chocolate reindeer pops from Hungry Happenings are the cutest, most adorable holiday treat. Rice Krispies treats are dunked into melted chocolate and decorated with candy eyes, a red jelly bean nose and antlers. The best thing about this project is that the most cooking you will need to do is melt the chocolate. It is important to note that after dipping the Rice Krispies in chocolate, you will have to work quickly so that the chocolate doesn't set. If this happens, it will be difficult to stick on the decorating features. Keep in mind this same technique can be used to make snowmen pops as well by swapping out the milk chocolate for white chocolate. For full recipe instructions, click here.